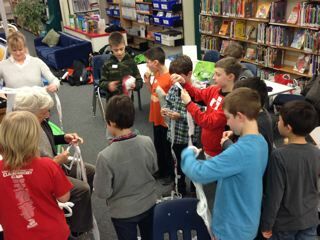 Twelve nine year-old boys spent two hours on the Friday of a long weekend learning how to make plarn (short for “plastic yarn," made by cutting plastic grocery bags into strips, then stringing them together into a single long strand) and crochet, with three amazing Alex House volunteers from our knitting circle there to teach them how. 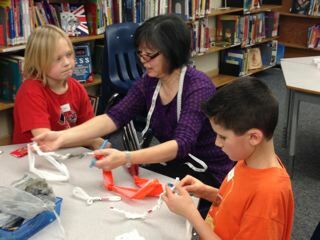 The activity was in aid of creating mats for homeless residents of our community. They also started talking about other things the homeless would need like pillows and blankets. At one point, one of the boys said, "This is the most proud of anything I've done in my life!" A tub to collect good quality, thick plastic bags for this project is located next to our clothing collection bin on the Sullivan St. side of Camp Alex, behind Alex Hall. Thanks to Susan Homenick, her son and his friends, for taking the initiative with this project! This is what building a spirit of community is all about!